Zhongshan Artigifts Premium Co., Ltd.
We are an OEM manufacturer provide high quality products with competitive price! 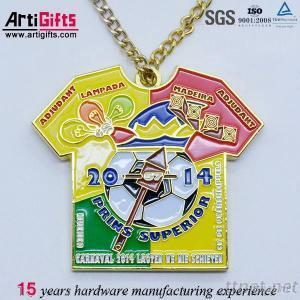 Our main products include Medals, Coins, key chains, lapel pins, badges, emblems, Dog tag, Cufflink, Lanyard, silicone bracelets etc. Processing	Stamped brass and iron, die casting, spin casting, photo etching, printing, laser engraving etc. Material	brass, iron, zinc alloy, stainless steel, 925/995 silver etc. Logo	soft enamel, cloisonne, Synthetic Enamel, Hard Enamel, Synthetic enamel without polish, silkscreen and offset printing, laser engraving etc. OEM	We can according to the different requirements of customers processing design and packing details. Gifty packing	leather and velvet box, bag, blister, backing card, coin box etc. Delivery Way - Date Of Delivery: 5-7days; 7-25days after receive your order confirmation.